Note the difference of response between first & second trials and inclusion of Clozapine trial after 2 trails. Also most focus of this approach is on Risperidone, Olanzapine & Clozapine. The findings of Olanzapine > Risperidone is in line with CATIE trial. - Is Clozapine not superior when used as first line? - Is First Generation Antipsychotics < Second generations as first line? what i m observing during my residency is that these patients with 1st episode of schizophrenia and those with ATPD responds best to haloperidol(we generaly give 5mg TDS). in some young patients with a short history there is a dramatic improvement in 2-3 days. There is no evidence for differences in efficacy between atypical and typical antipsychotics, but there was a clear difference in the side-effect profile. Thanks for sharing your experience Adisuper. We also prefer Haloperidol & Risperidone in most first episode psychosis. After reading that Algorithm approach article, I would prefer SGA over FGA (side effect profile issue). Good reference while explaining to high functioning patients and for those with curious family members. Isn't 5mg TDS a large dose. Is that because of non response to lower doses? Just curious. yes 5mg TDS is indeed a large dose but here we generaly start with it in young pts. with no medical co-morbidity as at this dose response is quick and if EPS do occurs(it occurs in 2 in 10 pts on this dose) we add anticholinergics. We use this approach as village patients want a quick response and r otherwise inclined to faith healers. no documented evidence of using such dose its just experience of my prof.
schizophreniform disorder, or schizoaffective disorder. 498 patients were randomly assigned by a web-based online system to haloperidol (1–4 mg per day; n=103), amisulpride (200–800 mg per day; n=104), olanzapine (5–20 mg per day; n=105), quetiapine (200–750 mg per day; n=104), or ziprasidone (40–160 mg per day; n=82); follow-up was at 1 year. The primary outcome measure was all-cause treatment discontinuation. Patients and their treating physicians were not blinded to the assigned treatment. Analysis was by intention to treat. This study is registered as an International Standard Randomised Controlled Trial, number ISRCTN68736636. [0·35–0·76]), and ziprasidone (HR 0·51 [0·32–0·81]). However, symptom reductions were virtually the same in all the groups, at around 60%. This pragmatic trial suggests that clinically meaningful antipsychotic treatment of first-episode of schizophrenia is achievable, for at least 1 year. However, we cannot conclude that second-generation drugs are more efficacious than is haloperidol, since discontinuation rates are not necessarily consistent with symptomatic improvement. 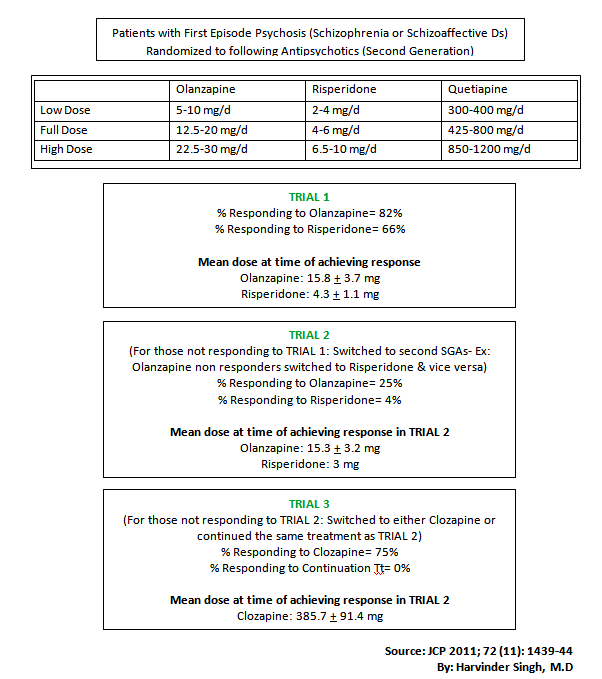 "The maximum dose of haloperidol was set at 4 mg per day, since studies have suggested that patients with first-episode schizophrenia respond to low doses of antipsychotic drugs.19,20 Furthermore, higher doses do not increase the antipsychotic effect of haloperidol, but do increase the risk of side-effects, especially in patients with first-episode schizophrenia.21–26"
randomised clinical trial. Lancet 2008; 371: 1085–97.